The first celeb shop of Twosome is which was opened at Apgujeongon July, 2011 by So Ji Seup. This place is directly run by So Ji Seup and people can taste his menus there and vary popularized nationwide, which in turn made this shop nationwide top 5 shops in sales. More than 15 of customers in this shop are Japanese. Sales of MD(Merchandise) such as Tumblr with signature of So Ji Seup, mug, T-shirt and other products exceed 20 times at general shops. Menus such as Vanilla Sakerato, and citron ginger tea and other developed by So Ji Seup are exclusively sold this shop and then delivered to all Twosome shops in Korea. And now these menus became major menus of Twosome. The second Celeb shop is which is opened on January 30th. This shop is always crowded with fans from all over the world as it is named after a Korean Wave start Choi Si Won who is very popular in South East Asia and China. Popular menus in this shop include ‘Cho Si Won Special Blend Coffee’ participated by him, ‘Choi berry cheese cake with ice cream’, ‘Balance box’ Moreover this shop has ‘Choi Si Won Entertainment Room’ where his fans can deliver their messages to him’ playing role for attracting Korean Wave fans. In addition, Italia cookie ‘biscotti’, which was produced with limited amount of 10,000 till the end of April for the purpose of contribution by its profits to celebrate openness of the shop, is expected to be sold out at the end of this month as it has already been sold more than 7,000 EA. The third Celeb shop is that is opened on Feb 14 in front of Hongik University by cooperation with YG’s representative producer ‘Teddy’ and Twosome coffee. For this shop, Teddy has deeply been involved for all aspects ranging from designs such as logo, interior, uniform, cup and packing paper to hand drip coffee, sandwich, Scone and even music heard from the shop. Especially, on the day of opening shop, a wreath arrived on the shop from a world singer Psy, and an entertainment agent YG’s representative stars such as Bingbang, 2NE1, Epichigh visited the shop, which gave rise to moccasin telegraph to people and this shop enjoys rapid sale growth and is crowded with lots of Korean Wave fans in front of the shop in the morning even before it is opened. 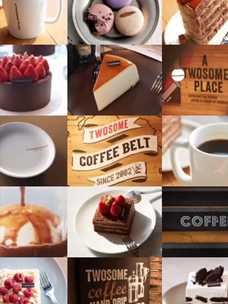 Indeed, all of Twosome shops participated by So Ji Seup, Choi Si Won and Teddy sell their special menus containing preferences of corresponding celebs. In addition, So Ji Seup and Choi Si Won actually visit the shops once a week and Teddy is known to frequently visit his working room at 4th floor of the shop. These participation with authenticity from celebs are transferred to all of country via SNS cannels of customers and thus their shops have become “Hot spots” where Korean Wave fans need to visit and moreover, these are proved to give positive effects for Twosome to enter global markets. A person in Chinese Twosome said “More people who visit Chinese shops are asking us to provide same menus as corresponding Celeb shops questioning whether menus are same brands as Celeb in Korea” and “We feel that moccasin telegraph is rapidly spreading on site and this reaction is expected to give positive roles for global future businesses of Twosome” In the meantime, Twosome is running 8 shops at 4 provinces such as Qinyang, Tienjin and Shanghai since it entered Beijing on August, 2012 and it is scheduled to open 9th shop in Beijing this month.